There is an ongoing sense in many Western companies that there’s a “gold rush” going on right now in China. Having surpassed Japan to become the world’s 2nd-largest economy after only the United States (3rd-largest if you were to count the entire European Economic Community), and having done so in only a few short years, it seems as if business opportunities for Stateside companies would be ripe for the plucking. Consider, for example, that China is now General Motors’ largest consumer market. Consider how Ford and Chrysler cars, jeeps, and SUVs are all coveted items among China’s surging middle class. 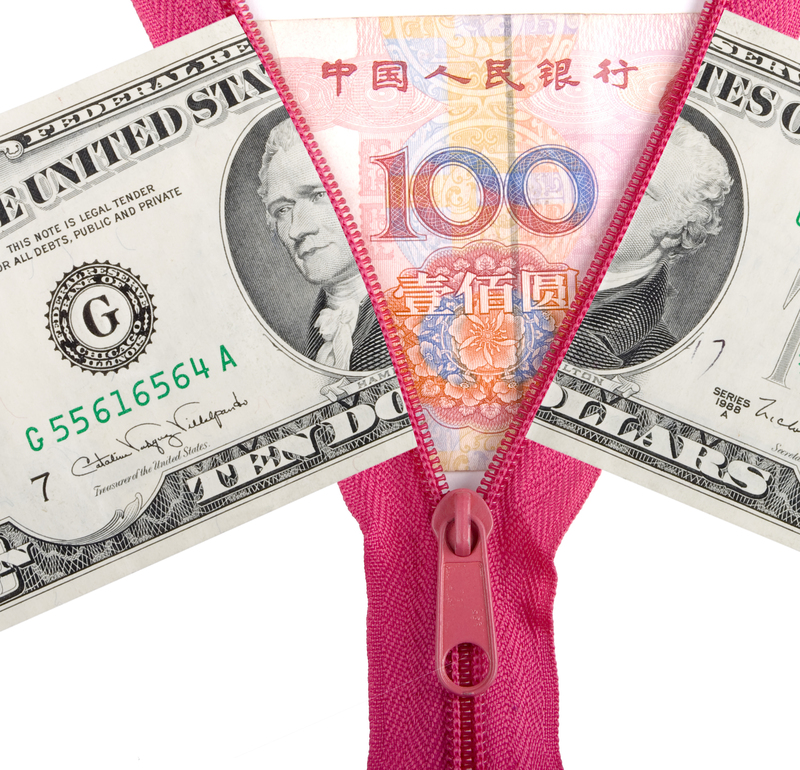 Consider that designer-brand American jeans, American basketball star-endorsed shoes, and American hip-hop mogul-endorsed liquors, are all making their powerful (and pricey) impact on Chinese consumers. But that would be reporting the tip and not the iceberg. Having been in business in China long before certain overhyped brands of vodka, we at Liftomatic can attest to the need for patience and persistence in doing business in that, yes, very potentially lucrative market they’ve got going. Our work in China has been ongoing since the late 1980s, when China was going through the first real throes of modernization that we now see transforming every aspect of its cities, villages, and farms. We arrived in China at a time when most Chinese warehouses possessed drum-handling technology equivalent to America immediately after World War Two. Like many American businesses today, we reasoned that our brand-name (used by the likes of DuPont) would carry us far and wide throughout the country. And you know something? It worked. It eventually worked… but not without many years of trial and error in forging the right business contacts both locally and regionally. Not without floundering in limbo, waiting for calls to warehouse managers to be returned. We didn’t realize it – and many North American businesses still don’t realize it – but we were already up against breakneck competition for the Chinese market from the get-go, both from international and Chinese companies. When going into business in China, don’t come in there with a “gold rush” mentality. There are endless profits to be made, but only if you establish a solid local presence in the country. Coming in as a tourist and brandishing about your new designer jean label will only earn you closed doors, or, at best, imitators of your brand (who have the means of beating you at your own game). Without a sense of long-term commitment, without “being in it for the long-haul,” without boots on the ground your business in China is going to be surpassed, or surreptitiously replaced by a rival. But if you’re ready for the long-haul like Liftomatic, and have a great product as well as a strong business model, you will succeed… just give it some time. 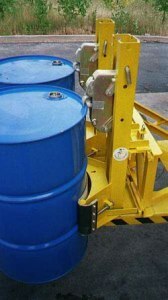 A L4F drum handling attachment from Liftomatic being used to collect 4 drums at one time at the end of a conveyor line – no manual handling and only a single operator involved. If our decades of experience in the material handling field have taught us one overriding lesson, then it’s how best to optimize a distribution center or warehousing company’s ROI in drum handling operations. If it means updating inefficient equipment and work procedures to meet the demands of the market (not to mention your competition), then so be it. One must not only be assiduous in how one sums up the current needs of his or her operation, one must also anticipate trends, opportunities, and backlashes that might come along the way. One must get in the habit of gauging where the industry is gradually heading, as well as determining where the profit is being made (and getting lost), and then plan accordingly. 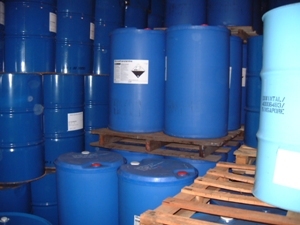 So much of warehousing is a do-or-die business, and every advantage and/or trick-of-the-trade can mean the difference between black and red ink. Take the common case of what we encounter frequently in China (though this certainly applies to many warehousing outfits in the Americas and elsewhere globally): a company that not only possesses a vast amount of warehousing space, but boasts a large, able-bodied workforce that can carry out any task given to them. What’s wrong with this picture? Well, nothing’s wrong, unless the company in question isn’t utilizing its warehousing space to maximum effect. This often happens when the company tries to use brute labor in place of technology. If the company in question only uses manual hand trucks for instance, there’s no human way to lift and stack drums higher than a single barrel high in a warehouse. Rather, forklifts with drum-handling attachments are needed. 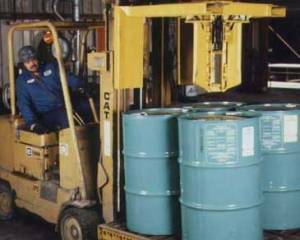 With a forklift, you can stack drums many units high – as high as the forklift’s hydraulics and integrity of the drums will allow. Imagine being able to increase cubic utilization by two, or even three times. Investing in the right equipment may not feel beneficial in the short run, especially when it comes to your operating capital. But given the long-term advantage of exponentially growing your storage capacity, the savings costs may well be worth it. Moving drums by hand truck or pallet is labor intensive and costly. It’s a safe bet that the final cost of any product increases on account of its material handling function. In fact, the Material Handling Industry of America estimates that material handling can boost a product’s final sale-price up a stunning 40%. In today’s fast-moving blur of a global economy, companies simply cannot afford to skimp on the right kind of material handling for their products. Ignoring the problem of how best to ship their products can mean the difference between a company’s quarterly profit and its quarterly loss. Technology can speed up the process and a provide a high ROI. Take, for example, your typical warehousing operation in China from 15 years ago (this isn’t to say that many such operations don’t exist still today). Time and again, when we approached these warehouses about adopting our drum handling technology, we found staggering amounts of waste happening in their way of doing things. You would have two workers loading and unloading drums using a hand-truck or a wooden pallet. For anyone who’s ever performed that kind of work, the labor intensiveness (and number of man hours involved) is well-known. While labor in China several years ago may have been abundant and inexpensive- that is not longer true. Additionally, you simply cannot throw enough labor at a drum handling problem to move items fast enough to maintain the throughput required in these logistics operations. It’s physically impossible to do. But by using a forklift and a 2-drum attachment from Liftomatic, the number of man hours involved in loading and unloading gets reduced to maybe a half hour’s time, increasing efficiency and throughput. When you add up the sheer number of drums that many of these Chinese warehouses handle in the course of a month, you can begin to appreciate how Liftomatic drum handling equipment can save warehouses a (not so) small fortune in terms of ROI. In the following entries, we will be taking a closer look at some of the ways that modernizing your material handling equipment can hugely impact your company’s ROI. We’ll explore such issues as storage capacity, drum damage, and safety. Furthermore, we invite anyone who’s had experience with optimizing their warehousing equipment and/or operating procedures to chime in on this blog. Founders E.J. 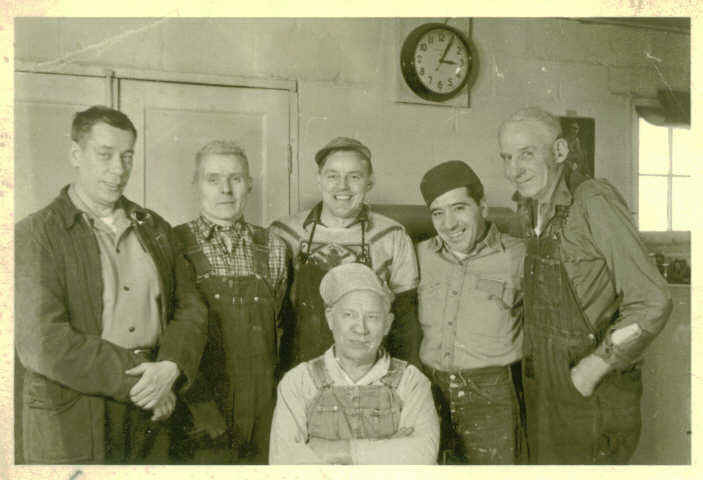 Berg and John Erickson with the original staff. 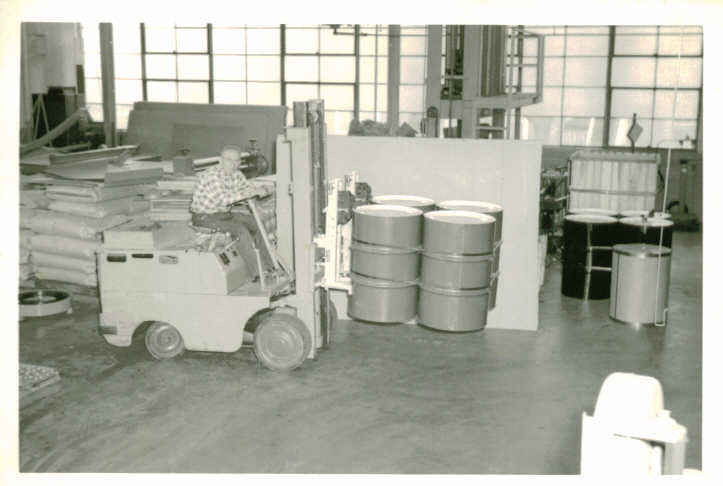 Liftomatic had its 1947 origins in a technology that was first pioneered by a German company, Mauser, in 1903, and by the end of the Second World War had become a universal standard for bulk shipping: steel drum containers. During the course of America’s involvement in the war, American companies such as DuPont manufactured tens of millions of steel, plastic, and fiber drums to supply Allied armies with everything from gasoline to canned food. 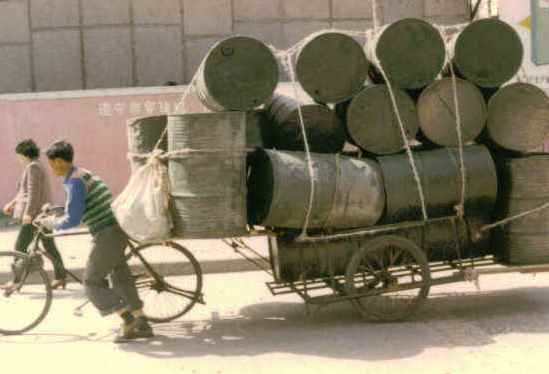 By war’s end, a world without 55-gallon drums made out of 12-16 gauge steel was more or less impossible to imagine. But 12-16 gauge steel drums, especially millions of them, require huge amounts of manpower to handle and haul. The common practice in World War Two was for American servicemen to roll the drums off the ramps of ships and up into 2 ½ ton trucks waiting at the dock. These trucks would then ferry the steel drums to whichever fighting unit required resupplying. The whole process worked well enough certainly for Allied forces to win the war, but there was a level of backbreaking discomfort that went into manually lugging millions of these all-purpose containers across the battlefields of Europe. To be sure, there were portable hand-trucks to help make this process easier, but the steel drums had a nasty tendency to topple off the hand-trucks while being carried. A better solution needed to present itself. Hyster forklift with a single model FTA drum lifter (then referred to as the PTA). In 1947, two men in Chicago, Liftomatic’s original co-founders, came up with just the solution. At that time, one of the men was working in a company that manufactured carbon blocks of graphite powder for use in mimeograph machines. He noticed just how frequently the drums of graphite toppled off their hand-trucks, their contents spilling across the factory floor. That man spoke with a friend of his about the issue he was facing at work, and the two of them proceeded to invent a device called the Parrot Beak that would solve the problem once and for all. The Parrot Beak’s design was as simple as it was ingenious. They came up with a two-wheeled hand-truck that could grasp a steel drum by its top lift, providing stability at the top where before there was none. The two men dubbed their invention “the Parrot Beak” because its top-grip looked like the beak of a parrot when it clamped down on the top of a drum. After managing to sell six Parrot Beaks to DuPont, the two founders knew they had hit upon a product that any major company in the world would find worth purchasing. Thus Liftomatic came about. Within a year, the two founders stopped working out of their garage and purchased a factory to build their new invention. The story of how they got the place is worth relating. Apparently, a Chilean chemist in search of the right chicken feed had been housing hundreds of chickens in the building, feeding them his various formulas. As fate would have it one February night in Chicago, the chemist’s employees got drunk and had a party in the factory. They left the windows open. The resulting icy cold seeped into the building, and by morning, all chickens were deceased. It took one fifteen minute phone-call from the folks at Liftomatic to secure the building from its former owner. Liftomatic had launched and was well on its way to becoming a fundamental part of how the world handled its container cargo.